It is a very unglamorous way for him to travel; he is squashed in my flight bag, between a new blood pressure monitor, a mug from Harrods, a box of old photos and my cardigan. He must be uncomfortable, but I didn't want to trust him to the suitcase and sub zero temperatures in the hold. He is way too precious. 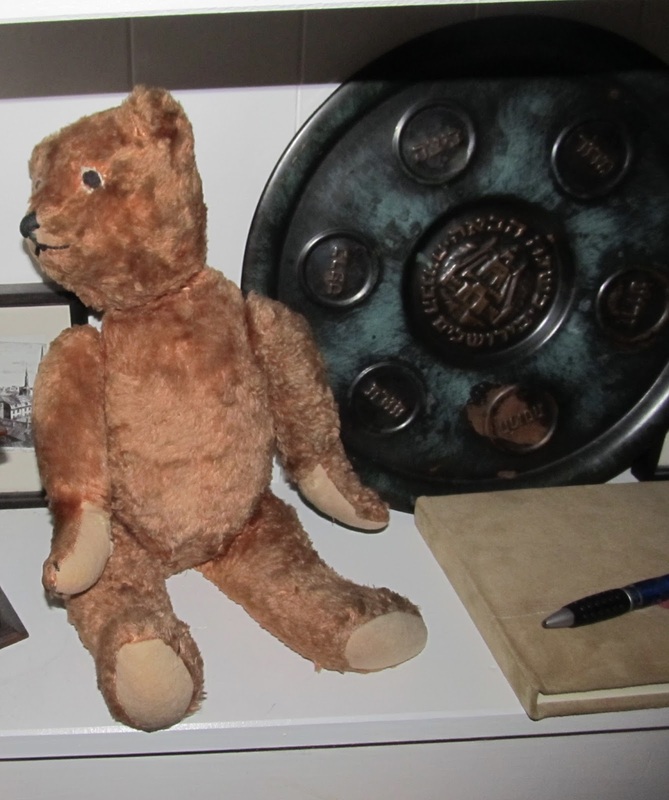 He is to be finally reunited with another ancient bear at Coneysthorpe who sits on a shelf in our long hallway. He was rescued and emigrated several years ago. The smaller mohair bear had somewhat mysterious origins. I think he may be my grandpa's bear, so we now have a representative from both sides of the Yorkshire family. It was about time they had each other's company. After all there's a lot to talk about now they are in the antipodes. How nice for them to be together! Also, when I was growing up, my parents had that exact seder plate... where did you get it?? The seder plate was purchased on eBay! We don't often buy things that way, but they are surprisingly difficult to buy in NZ. Not such a big Jewish community here, and I suspect many people have items handed down in the family, which we don't.